This year I gave up my full time job of 18 years to commit to my dog training business full time. The job I left, was almost guaranteed until I was 60 years old and paid well enough to afford me a comfortable life. I took a risk, albeit a calculated one, in doing so. I know I’m not the best trainer in the world. I know that I still need to learn over 99% of what I need. I know there are better hobby trainers out there than me who have loads of titles for their dogs and I recognise this huge achievement with their dogs and count some of them as my friends, a few I have know for many years, and know I can go to them to learn how to be better. I have yet to do this, maybe in the future, time permitting, I will be able to commit the necessary time to doing this myself. I am good at pet dog training and dealing with behaviour issues such as aggression, reactivity and fearful behaviours. I never trivialise the effect that a client’s dog’s behaviour can have on their lives, I know only too well how stressful it can be living with a dog who’s behaviour has the potential to make your life a misery. I’ve tried to identify the reasons I am successful and where my weaknesses lie on order to remain both humble and to improve. I think am patient and a good teacher and feedback from clients confirms this. 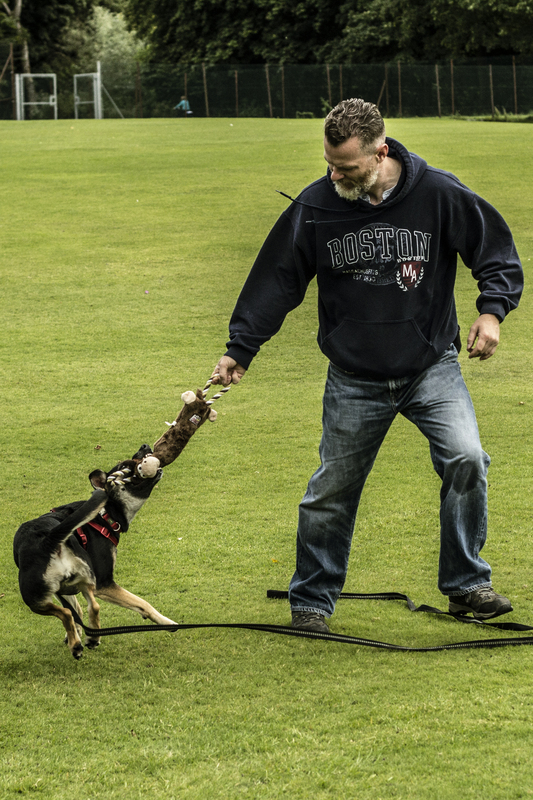 I try to explain in human terms why your dog acts the way he does so that we can modify his behaviour in the elast stressful/most fun way (for both client and dog) as possible. In the main I am successful at this. I am good at promoting myself. I make no bones about this. I am not interested in being famous, but if no one knows who you are or what you can do, then no clients come to you and your business fails. My business puts food on the table no, as it is what I do fully to earn money. If you are the best trainer in the world and no one knows about you, what’s the point of being in business. Dog trainer fail in their careers for many reasons one of which is that they are not business minded or commercial enough. It takes a lot of hard work and is constant. One of the other reasons dog trainers don’t have successful businesses is the amount of horrible, destructive attitudes and comments from other trainers who call themselves positive. They may be positive in their training towards dogs but not so much in their views and attitudes of other trainers. I have my own feelings about their motivation. A few years ago a very good trainer and positive force for this industry was hounded out by a few petty, jealous individuals who basically launched an online hate campaign against him. It’s the industries loss as his absence potentially makes a gap for a pack leader trainer. We need to teach those who are interested in learning. I am by no means saying to do this for free. I have a couple of private lessons lined up and am paying the trainers involved. I am fortunate enough to count Ian Dunbar as my friend now, bu I still pay to go to his seminars, our friendship give me other benefits professionally, but I still recognise what he does to earn money. If we want our mission of non aversive training to be a force in the world we need to support those involved in it. Refer clients to others, be generous in our attitude towards other likeminded trainers. I was at the gym the other day and their was a sign saying “Every time you don’t put your weights away, Justin Beiber writes another song”. Everytime a good, positive trainer leaves this industry because of burnout, a force trainer has the opportunity to fill the space.